This deal will end at 11:59 pm on Monday, 12-2-13. Just log in with the information below and purchase as much as you’d like. If you’d like to split your purchase between multiple certificates…leave me a note in the notes section. On Tuesday I’ll email your gift certificates. I’m going to leave the To: and From: blank so you can save them for yourself or give them as gifts to your friends and loved ones this Holiday. 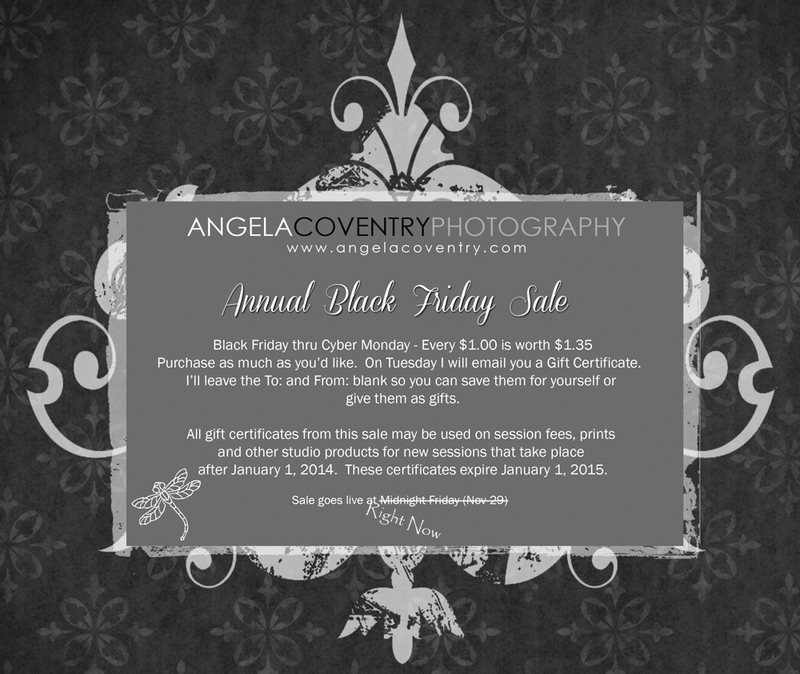 All certificates purchased with this deal may be used towards session fees, prints or other studio products for new sessions that take place after January 1, 2014. These certificates will expire January 1, 2015. May not be used towards Mini Session Specials or Forget Me Not sessions/products. Select the image and add the quantity to your shopping cart. For example if you’d like to spend $75 you would put 75 in the quantity and I will email a certificate for $101.25.